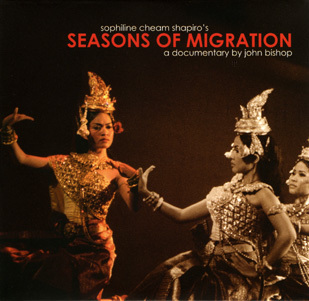 Seasons of Migration is a documentary about Sophilene Cheam Shapiro's four part classical Cambodian dance about the stages of culture shock. It blends the dance with commentary about the music and choreography, and personal stories of emigration and culture shock from Cambodian-American residents of Long Beach, California (the largest Cambodian city outside of Cambodia). A second video presents the complete dance, shot with multiple cameras. The dance is interesting for its use of a classical vocabulary to address contemporary themes. It was produced by John Shapiro of the Khmer Arts Academy.